Welcome to all NPs, NP students and individuals or organizations interested in the NP role! AANP is your community, strengthened by the support of more than 97,000 members. Together, we are working to improve patient care and advance NP practice. Learn more about AANP and the progress your membership makes possible. Your association is led by NPs who volunteer their time and expertise to ensure that NPs and their patients have a voice wherever important health care conversations are occurring. Meet your board of directors and explore ways that you can help make a positive difference for your profession and patients. Meet elected leaders from your state, territory and region who are on the front lines of health education and advocacy. If you’re interested in connecting with NPs in your area, you can access a list of NP organizations near you. AANP welcomes opportunities to partner with corporations and organizations to help the more than 270,000 NPs licensed to practice in the United States improve health outcomes for their patients. Thanks to the support of Corporate Council members, sponsors and exhibitors and relationships with numerous collaborative alliances, AANP continually advances toward its goal of promoting excellence in NP practice, education and research. AANP has outlined a number of positions on issues of importance for NPs nationwide. In addition, AANP discussion papers offer pros and cons to enhance understanding and encourage continued discussion. AANP wants to hear from you on the largest social media networks, where association members, NPs, NP students, patients and even some legislators gather to discuss important health care issues. Join the conversation to receive timely information and to share your thoughts with fellow NPs. Are you interested in reporting on one of the fastest growing roles in primary, acute and specialty health care? Would you like to learn more about the critical role NPs play in expanding patient access to high-quality, compassionate, patient-centered care? AANP can help by providing data, connecting you with experts and clarifying information about the NP role and trending health issues. You can also access recent public awareness campaigns to learn more about the NP role. NPs have an exciting story to tell, and so does AANP! It all began under an apple tree in Pennsylvania with a handful of visionary NPs. Explore AANP’s historical timeline to see what happened next. The future is bright for NPs, and AANP is preparing for your upcoming needs by constructing a new national headquarters in Austin, Texas. Watch the exciting progress being made on the building and learn how you can leave your mark on this historic structure. Review the bylaws that govern AANP to learn important details about the association’s structure, membership categories, elections process, leadership and more. What is the AANP P.E.A.R.L? Discover the mission, vision and values that unite more than 97,000 AANP members. Thanks to member support, AANP steadily moves the mark forward on issues of importance to NPs and their patients. Review reports from several years to learn how the NP role and your association have grown. 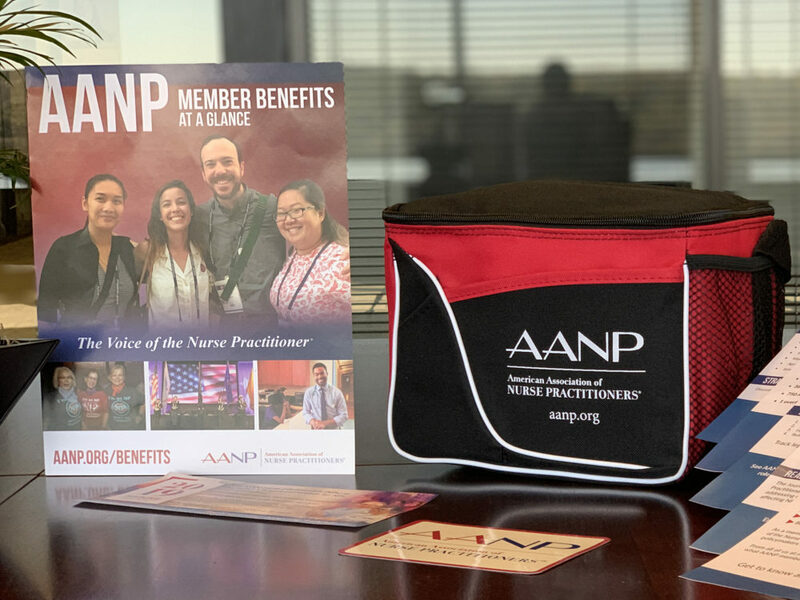 AANP is looking for talented individuals to join our dynamic team as we build the premier organization for nurse practitioners (NPs) everywhere. How may we serve you? Do you have a question, comment or suggestion? Please share it with the AANP team. We’d love to hear from you! Show your AANP pride. Become a member using the code AANPSuccess for a 5% discount on membership dues and receive a free AANP lunch bag!